Andrew is a senior physiotherapist and is a graduate of the University of Sydney. He previously worked at the Royal North Shore Hospital, Sydney and consolidated further skills in the management of acute orthopaedic traumas and fractures. Following this, Andrew has been working in private practice and has been consulting between Sydney and Canberra. He has also provided sports coverage for various soccer and rugby clubs. Andrew has strong interests and extensive experience in assessing and treating musculoskeletal, orthopaedic and sports injuries for the neck, back, upper and lower limbs. 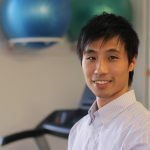 He is qualified in advanced dry needling and has over 10 years of experience in hydrotherapy / aqua-physiotherapy. Outside his normal in-room consultation hours, Andrew has worked extensively with orthopaedic surgeon, Dr Damian Smith and attended his weekly fracture clinic services at Orthopaedics ACT. He also worked closely with orthopaedic surgeon, Dr Joe Lau from Expert Orthopaedics on complex foot and ankle cases. Andrew has presented at hip and knee joint replacement seminars. He has also presented on ACL (anterior cruciate ligament) reconstruction at the APA Orthopaedic Network. Andrew is experienced in treating a wide variety of clienteles from elite athletes, diplomats, public servants / office workers to the young and elderly. He is passionate in delivering high quality care to his patients and liaises closely with referring GPs, surgeons and allied health professionals. In his own time, Andrew enjoys travelling and sporting activities, particularly table tennis and badminton. Andrew works on Monday, Wednesday and Thursday at Burns Bay Physiotherapy. If you would like Andrew to look after you, why not give Burns Bay Physiotherapy a call.